I don’t like “gotcha” media criticism, especially the kind that attempts to elevate some completely human error – either intentional or not – into a mortal sin. Some sins – especially of the journalistic variety – do have serious consequences for the victim of the inaccuracy or typo, can mislead and confuse, and can plant seeds of fear and anxiety in communities already reeling from one trauma or another. Not good. But I really need to see intentional malice or serious negligence to go from annoyance to indignation. 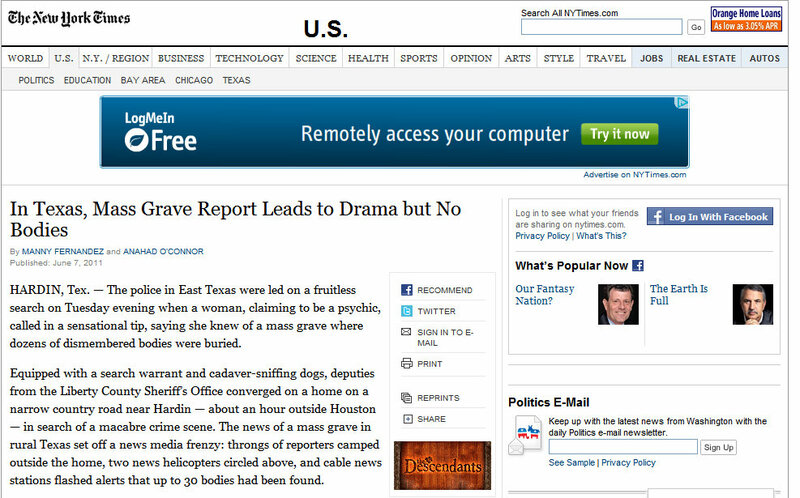 Yesterday afternoon, in quick succession, I received several news bulletins about 30 dismembered bodies that had been found buried outside Houston. The news bulletins, which I include here, came from serious news organizations, and were phrased with language implying enough certainty that I immediately forwarded the news to some colleagues at John Jay College’s Academy of Critical Incident Analysis, a research group in which I participate. Among other things, we are interested in the impact of sudden high profile catastrophic incidents on public attitudes, behavior and the larger social order. Most of you already know how it ended. 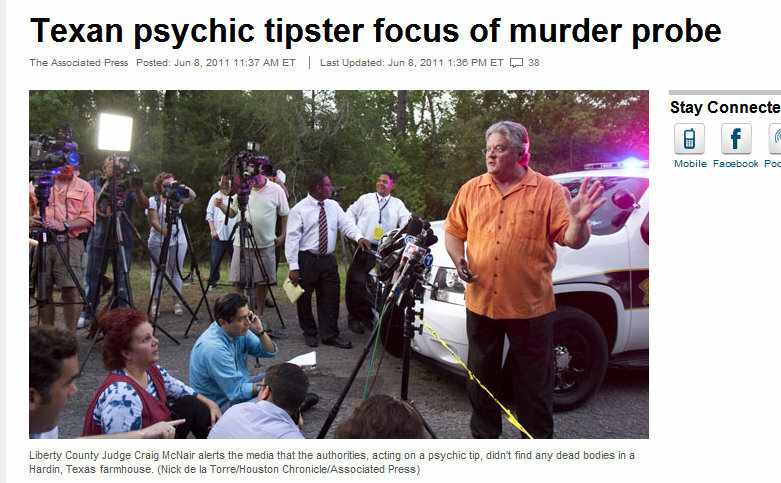 It was a completely inaccurate report that had originated with nothing more than a tip from a psychic. It should never have been elevated to the status of an urgent bulletin. Even worse, in this case, is that several of the bulletins were neither hesitant nor qualified. Bodies had been found. The serious news organizations that made this bizarre leap will certainly examine how and why this happened and determine how to avoid it in the future. It was not a routine mistake. It was bad. Real bad. First there were bodies and then there were none. But less than focusing on the mistake, I think we need to think carefully about a newsgathering environment that has elevated speed to such importance that time for contemplation and evaluation may have slowly slipped away. Speed, of course, has always been part of the highly competitive journalistic enterprise. The 20th century began with bloody battles between Hearst and Pulitzer over who could get the first and second and third extras to the newsstand first. Since then, though, speed as a term has almost completely lost its power to describe the “speed of sound” global news environment. One piece of news, launched on the most appropriate channel, can be global in minutes. Rather than being something that can be pulled back or reconsidered, an inaccuracy is now launched into permanent orbit and circles and circles the globe even after it has been throroughly debunked. And sometimes the subsequent “debunking” gets infinitely less play that the initial nonsense. We are now in a world where caution isn’t simply important, it is absolutely required of anyone who reports anything, including each of us as we report things to each other. Yesterday, lots of people in lots of places – fearing being slow in the age of the fast – skipped the caution. And the result is that there will be a pit of dismembered bodies outside Houston for a long, long time. Even though it really isn’t there at all.